'Ksan Campground is a beautiful campground featuring private tree-enclosed tenting sites and open pullthrough sites with electrical/water services. 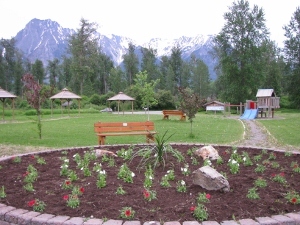 'Ksan Campground is located at the confluence of two great rivers, the mighty Skeena and the Bulkley River. A great spot for fisherman and nature-lovers alike. Amenities at this campsite include: playground, enclosed gazebo for group meals/gatherings, hot showers, running water, flush toilets, nature trails, public phone and WiFi. The campground office offers amazing souvenirs, gift items, and beautiful artwork designed and crafted by local artisans. Featured in the Smokehouse is a coffee bar to satisfy your need for a quick java fix or a slushy for the kids. Located in the heart of the Gitxsan Nation, 'Ksan Campground offers a glimpse in to our local native culture through artwork and events. Located adjacent to the campground is the 'Ksan Historical Village and Museum and a couple minutes walk/drive is the Historic Village of Hazelton.